CAS 3H or LilacSat 2 is a low-cost, nano-satellite for education, amateur radio communication and technology demonstration, built by a team of 15 students of Harbin Institute of Technology (HIT). It is a cube-shaped 20 cm × 20 cm × 20 cm satellite with a weight of 11 kg. LilacSat-2 provides hands-on experience for students who would not otherwise have the opportunity to build flight hardware for a space mission. The training these students gain by working on this project will better prepare them for work in the aerospace industry. An SDR based multi-band receiver, for reception and decoding of signals from AIS, ADS-B, etc. An FPGA software testing platform. 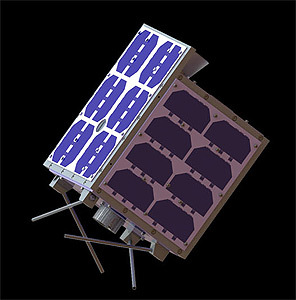 The lifetime of LilacSat-2 is expected to be 3 to 6 months. The planned orbit is 520 km × 520 km with an inclination of 97°. LilacSat 2 was launched in a cluster of 20 satellites on the maiden flight of the CZ-6 rocket.